The striking roof canopy provides all-weather protection for the 204m2 sky court. The tubular steel and fritted ETFE canopy frames views out in two directions over central London, wraps up and over the garden and extends four storeys down the face of the southwest façade in a diagrid to assist solar shading. The structure consists of a continuous CHS diagrid frame that is supported on eight tree columns that cantilever up from the main building’s 16th floor steelwork. Additional struts extend from the ends of the cantilevered main building steelwork that act to restrain the clad sidewalls. Further supports are provided off the façade for the open mesh apron. The geometry of the structure is complex – the asymmetry of the support positions that are set out based on the main building grid below results in eight different tree columns and the roof diagrid is subtly pitched in four directions to generate falls. Due to the number of site and structural constraints, the only feasible option was to fabricate and deliver the structure in individual pieces to be assembled and bolted together on site. However, in order to give a seamless appearance to the structure, it was vital that none of the bolted splice connections were visible. The roof grid joints are fully welded connections formed with the help of CNC ‘cods-mouth’ type complex laser cuts to the ends of each CHS branch stub member. Joints in the steel diagrid were achieved using hidden ‘hand-cup’ type splices where bolted connections are formed within the tubes themselves. The column branching nodes were formed from a series of fin plates welded around a central stub which, in turn, were slotted into CHS elements that form the branches. The final nodes were then clad in multi-curved nylon shrouds produced using 3D printing. Trial erection offsite allowed the complex erection methodology to be verified and refined. The canopy was fixed to the façade of the primary structure using architectural stainless steel pin connections and brackets. The structure was initially painted offsite with a final decorative site applied coat required to achieve the perfect finish. This was quite a challenge at the top of a 16-storey building and required the use of specialist MEWPs and rope access technicians. The final finish was a faultless light metallic sheen to complement the simple elegant nature of the structure. Main Contractor Skanska Construction UK Ltd. 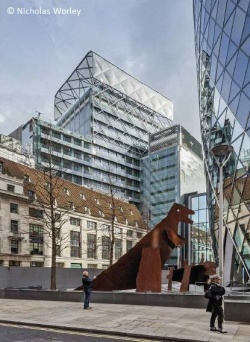 Client Bevis Marks Developments Ltd. The diagonal framed steelwork and ETFE canopy is a most effective feature distinguishing this office building in a densely packed city. 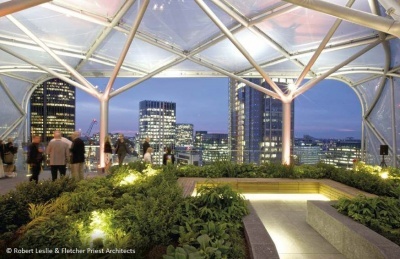 Challenging technical constraints were effectively resolved to provide a most desirable and popular roof garden. Additionally, this provides an often-ignored fifth elevation of the building, as seen from the surrounding townscape heights.